Over the past several years, The Nationalism Project underwent relatively little revision. Assistant Editor Catherine M. Burns did excellent work updating journal articles and adding conferences, we added a new section called "new books," and I completed an overhaul of the site's appearance—but that is more or less it. As a result, the links section grew dated and a host of other issues cropped up. All that is now changing. Several weeks ago The Nationalism Project enlisted the help of Aaron Mitchell, a talented undergraduate at the University of New England. Mitchell is a double-major in political science and history. Over the coming months, he will be working with Catherine and myself to bring all TNP content up-to-date and to add as much new material as we can locate. If you are aware of information that is missing from our site, please let me know via email at: egzuelow@uwalumni.com. 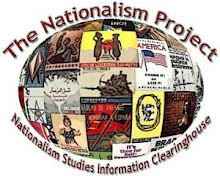 We're anxious to make sure that The Nationalism Project remains the most up-to-date and comprehensive nationalism studies resource available on the World Wide Web.